A Pfizer-produced biosimilar of Roche’s blockbuster breast cancer drug, Herceptin, has been rejected by US regulators. Pfizer explained that the additional information requested by the FDA in its dreaded Complete Response Letter (CRL) did not relate to safety or clinical data but focused on additional technical information. Herceptin (trastuzumab) is a biologic, a drug made in living cells or organisms, which means that it is difficult to replicate. Near-copies shown to be as safe and effective are known as ‘biosimilars’, in contrast to generics – and they have the potential to save healthcare systems worldwide a substantial amount of money. The majority of biological medicines in current clinical use contain active substances made of proteins, ranging from the relatively simple insulin and growth hormone to more complex proteins, such as coagulation factors and monoclonal antibodies. Pfizer said it is working closely with the FDA to address the contents of the CRL and that it is committed to bringing its biosimilar of trastuzumab to patients in the US. In November last year, the European Medicines Agency approved the first biosimilar of Herceptin, Ontruzant, which was originally developed by Samsung Bioepis. It was launched in the UK in March this year, becoming the first biologic copycat version of Roche’s blockbuster to be available to patients in the region. MSD, known as Merck & Co in the US, is marketing of Ontruzant as part of a global biosimilars deal with Samsung Bioepis. In December, the FDA approved Mylan/Biocon’s biosimilar of Herceptin (trastuzumab), called Ogivri – the first to be approved for the US market. Due to an agreement with Roche, Ogivri may not be launched until 2019 at the earliest. South Korea’s Celltrion is also trying to get its Herceptin biosimilar approved in the US – but hit a setback at the beginning of the month when the FDA rejected it along with a rituximab biosimilar because of shortcomings at its manufacturing plant. 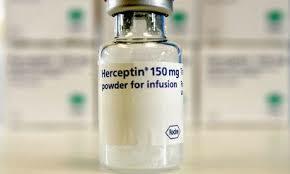 In 2017, Herceptin became one of the world’s most successful antibody drugs. It generated sales of 7.01 billion Swiss Francs ($7.18 billion) for Roche. The FDA approved Herceptin in September 1998 – the first treatment of its kind to target certain types of metastatic breast cancer.